Ultra-rugged and durable enough to stand even the most challenging environments, the COFFEEBOXX ($199 at Home Depot) is an electric coffee maker that can go where most coffee machines can’t. 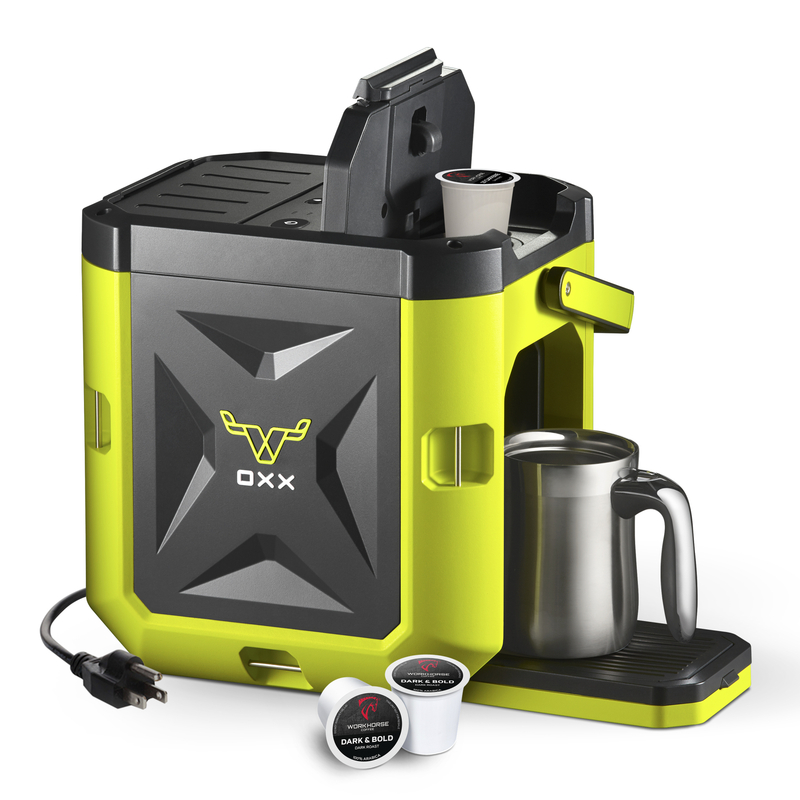 Originally designed to stand up to repeated use by everyone from builders and construction crews to hunters and anglers, the COFFEEBOXX isn’t your average camp coffeemaker. It’s compatible with single-serve coffee pods and works with all K-Cup pods, a self-contained filtration system free from the mess incurred when scooping ground coffee. And it’s virtually crush-proof; it would take a blow from an object over 1,500 pounds to put a notch in this machine’s impact-resistant polymer shell. Plus, it takes only 75 seconds to brew a piping-hot cup of coffee, and the machine even has a stand-alone hot water line for tea and such. The COFFEEBOXX has the largest spill-proof water tank on the market, allowing it to brew up to 10 cups of coffee. With a three-foot retractable cord that’s virtually tangle-proof, the device is perfect for vans, trucks, or RVs equipped with inverters and standard three-prong outlets. It’s durable and low maintenance; you just need to clean it on occasion. The only real drawback we could find is that the COFFEEBOXX needs a power source, so while it’s perfect for RVs, campgrounds, and worksites it’s no good for wilderness camping. For that, you’ll need single-serve coffee such as Pourtables. For more than 25 years, Men’s Journal has been the expert in all things gear — from mountain bikes to fitness trackers, blenders to watches, and drones to cars. Every product featured on this site is handpicked by our editorial team, which means we test or trust everything. We also include affiliate links; if you choose to buy something, we may receive a commission.